We are leading manufacturer, wholesaler and exporter of Extension Spring. We are offering our clients with sustainable quality Stainless Steel Extension Spring. These springs are widely used to pull loads or support tensile. Extension springs are also called tensile springs. Most extension springs are wound with an initial tension. This tension is the force that holds the spring coils wound together. These springs are used for special coiling and secondary operations and allows for over-stretching of the load. Our reputation in the market is largely attributable to our precision-designed Steel Extension Spring from our extensive range of springs. This spring is used to provide return force to components. The offered spring is precisely manufactured making use of the best quality steel and ultra-modern technology under the strict guidance of our adept professionals at our technically sound manufacturing unit. For ensuring its quality, this spring is rigorously inspected on various parameters of quality by our experts. Our precision-engineered extension springs are available in various shapes and sizes. These are made in variety of extensions as per customers applications.These are available in both conical and rectangular shape. Extension springs offer resistance to pulling force. Our extension springs find their applications in electrical components like switches and also in vacuum cleaner brush height control. Our in-depth knowledge and industrial expertise enable us to offer a distinguished range of Bed Springs. Owing to their precise size and high tensile strength, these springs are highly acclaimed by our patrons in the market. We manufacture these springs using quality assured material and contemporary technology as per the predefined industry standards. To deliver flawless products at our clients' end, these springs are stringently checked by our quality auditors against several parameters. 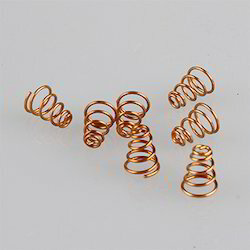 Our Phosphor Bronze Spring are available in various shapes and sizes. These are made in variety of extensions as per customers applications .These are available in both conical and rectangular shape. Extension springs offer resistance to pulling force. Our extension springs find their applications in electrical components like switches and also in vacuum cleaner brush height control.